To successfully command and control a battle, a commander needs to (i) be able to determine the strength of the enemy and observe its manœuvres, (ii) know where his own forces are and (iii) be able to direct those forces in a timely manner to surprise the enemy and defeat it. Prior to 1935 Royal Air Force commanders were not able to exercise any control over air defence battles; quite simply they had no idea where the enemy aircraft were until it was too late to prevent attacks on the UK and they had little or no information on where their fighter aircraft were once they had been scrambled. 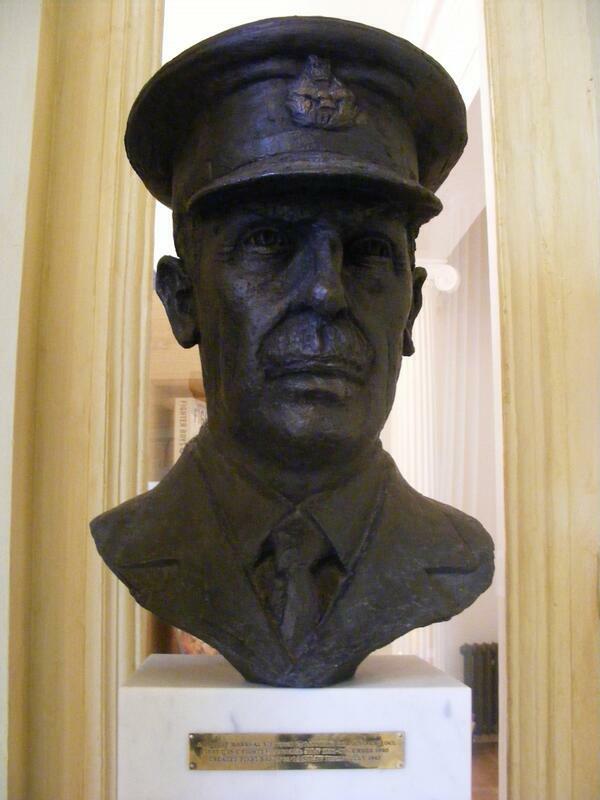 Air Chief Marshal Hugh Dowding was appointed Commander-in-Chief of Fighter Command in 1936 and faced a daunting task because at the time he did not have the technology to deliver any one of the main ingredients to successfully command and control a battle. Soon after the discovery of radar in 1935, Dowding recognised that radar was a battle-winning technological advance and worked tirelessly to build a system of air defence which included innovations such as the creation of the long-range Chain Home radar network, the shorter-range radars known as Chain Home (Low) and a Filter Centre which was based at RAF Bentley Priory. It was the mix of these new technologies which also included Identification Friend or Foe, Very High Frequency radios and triangulation techniques, that provided the components necessary for the development of the first modern command and control system which became known as the ‘Dowding System’. The Dowding System covered the whole country and had to coordinate and control the extensive radar system, ground observers, anti-aircraft artillery, balloon operations, command centres and the process for locating, directing and controlling fighter aircraft; all these disparate components were linked together through a telephone network installed and maintained by the General Post Office. The first challenge for the Dowding System was to detect enemy attacks at ranges that would allow time to mount effective counter attacks. The sensors of the Dowding system – the observe element - were both the radar system and the Royal Observer Corps. However, in 1940 the radar system really only looked seaward from the coast and, at that time, all overland tracking was done from reports from visual sightings by Observer Posts. The second challenge was to make sense of the often-confusing stream of information from the radar stations. The radar information was of little or no use in its ‘raw’ form and required skilled analysis to produce a coherent recognised air picture – this became known as filtering. During the Battle of Britain there was only one Filter Centre and it was based at Headquarters Fighter Command, RAF Bentley Priory. The Filter Centre had 4 distinct tasks; first, plotting on the gridded map table the detections sent from the radar units. Then analysing the information and removing ambiguities before defining and giving the radar track unique three dimensional characteristics. The Filter Centre then identified the track before disseminating the ‘product’ to operations rooms throughout the System. Initially the filtering process was developed and designed by scientists and it worked well but when the RAF took over the filtering task, the performance deteriorated markedly. This was rectified by specifically recruiting personnel with a scientific or mathematical aptitude and elevating the personnel to the status of an officer in recognition of the importance of the task. The first 15 RAF Filterer Officers took up post in June 1940 creating a new specialisation known as Fighter Control. Equally critical to the operation of this rapidly growing air defence system was a new trade known as Clerk Special Duties. Clerks Special Duties were deployed throughout the system as radar operators, plotters and tellers at both operations centres and at the Filter Centre. Initial training for radar operators was at RAF Bawdsey; extracting information from the radar displays was a very skilled task. Every radar contact was reported to the Filter Centre and plotted on a gridded map table. There were many duplications and ambiguities that had to be resolved to determine an accurate three-dimensional track with an identity. The product of this complex analysis then had to be disseminated rapidly to operations rooms across the UK so that commanders could successfully manage their part of the battle from a common air picture. The radar units were on the front line but designated as Air Ministry Experimental Stations to preserve secrecy. However, it wasn’t long before the Germans worked out the importance of the radar units and in August 1940 a number of direct enemy attacks were made against the radar units. After one of these attacks on 12th August 1940, Air Chief Marshal Dowding signalled the radar units expressing his satisfaction and pride in the behaviour of the WAAF personnel in the face of attack. Clerks Special Duties selected as plotters and tellers were trained at RAF Leighton Buzzard which was the Headquarters of 60 Group. 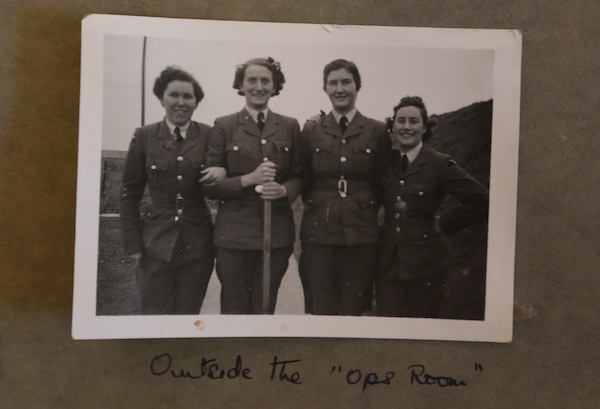 Here the WAAFs were further selected to be either filter plotters and tellers or operations room plotters and tellers. The term plotters and tellers does not do justice to the importance of these vital operational roles. The system of telling information from the radars to the Filter Centre and then to the numerous operations rooms across the Dowding System using landlines and a formatted telling sequence was time consuming but, as time was of the essence, both the plotters and tellers had to be quick and precise so as not to cause additional delays which could cost lives. 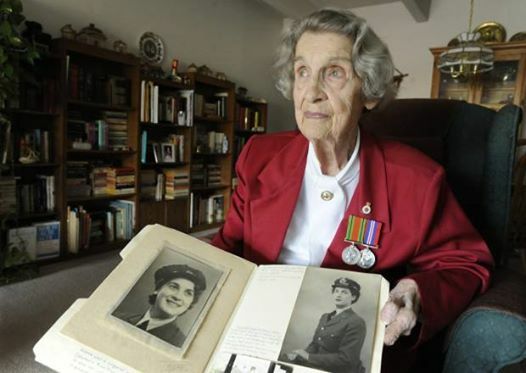 97-year-old Barbara Saks describes her experiences as a WAAF Plotter at RAF Kirton-in-Lindsey during the Battle of Britain: "The Operations Room was a large, high-ceilinged room, with the huge, sloping Sector Table Map occupying most of the space. My position was on the East Coast at the top of the table, because I could plot upside-down easier than the right way up, facing the upper deck and the Controller and Officer liaisons, and the lower deck and Non-Commissioned Officer liaisons. My friend Joan 'Kitch' Kitchen was on the North Sea position to my left at the end of the table. On the wall was a large clock, each 5 minute section coloured red, yellow and blue. Our plastic plotting arrows matched the colour of each 5 minutes, and if the plot was 15 minutes old, the former arrows laid down were removed, and we started again with red. Squadron numbers on duty were illuminated up on the wall near the clock. There were 4 duty watches of plotters, A, B, C and D watch, mixed RAF and WAAF. I was on "A" watch. We worked around the clock on various shifts for 3 days, then had a 24 hour stand-down from 1pm one day to 1pm the next." "15th September 1940 was a Sunday that year and it was my 23rd birthday. "A" Watch, my watch, was on duty in the Operations Room at RAF Kirton-in-Lindsey, on the morning shift, 8am to 1pm. It was the usual slow Sunday morning, 2 or 3 pilots practicing takeoffs and landings after breakfast. Nothing unusual. Then Intelligence came through that the Luftwaffe was sending over a second wave of bombers and fighters, bigger than the first, and a message went out all over Britain for every available pilot and fighter to report to the South. We had 2 squadrons of Spitfires and 2 squadrons of Hurricanes at that time, and they were all scrambled. We plotted them off the table. After the bustle of their leaving, there was no more activity, and it was very quiet, everyone left to his or her own thoughts. Many prayers went up that morning for the safe return of our pilots. We finished our shift at 1pm, and after a silent lunch, 'Kitch' and I went to our billet, waiting for news." During the Battle of Britain, pilots initially conducted the operational task of fighter control. Sector commanders were delegated tactical control of fighters within a defined geographical area and a team of sector controllers assisted them. 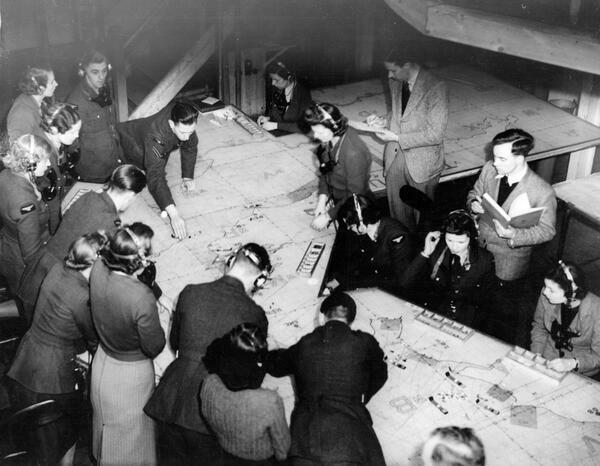 Working from the common air picture disseminated from the Filter Centre, which was further enhanced by Royal Observer Corps information, and plotted on the operations table, the sector controllers could then scramble fighters to meet enemy attacks. Once airborne, the position of the RAF fighters was also plotted on the operations table based upon triangulated information from radio transmissions. With both enemy and friendly forces plotted on the same operations table, the sector controllers now had the 2 main ingredients needed to direct the friendly fighters into a tactically advantageous position to counter the enemy air threat. From September 1940 the enemy changed tactics and launched more night attacks and the sector system of control, with its time lags and lack of overland information during the night, was not able to counter this new threat. Luckily the development of radars that rotated to scan 360 degrees and technical advancements which enabled an aircraft’s position and movement to be viewed in plan position meant that aircraft could now be tracked overland day or night and the data provided an accurate basis for interception. This led to the next significant step in the development of the Fighter Control specialisation, the creation of Ground Controlled Interception units. Initially 6 ground controlled interception units were commissioned and it seemed sensible to redeploy sector controllers from the sector stations to act as Interception Controllers. Sadly the results were quite varied but the immediate impact and success of ground controlled interception units led to a very rapid expansion in the number of units and there were simply not enough sector controllers available. Consequently it became necessary to train ab initio Interception Controllers; and the second key sub-specialisation of Fighter Control was created. 75 years on, Aerospace Battle Managers continue the legacy of those very first Fighter Controllers as they keep a constant watch over UK skies to detect, recognise and identify all the aircraft and control any fighter aircraft that may be required to react to defend our nation from attack.